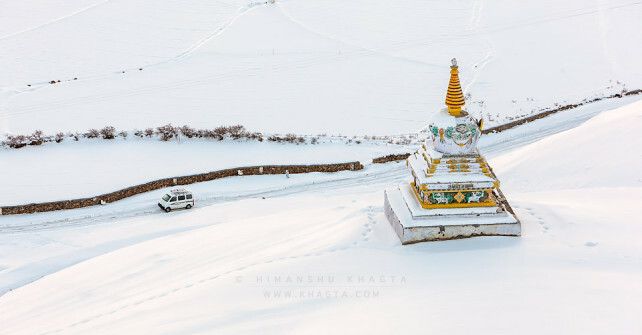 Winter is in full swing in Spiti valley and everything is covered with a thick layer of snow. The temperature is touching a minimum of -20.8˚C. Due to limited accessibility, challenging road conditions and extremely cold and harsh weather, only few get a chance to experience this majestic landscape. For those who do, go back with an adventure of a lifetime. Just like everything else, the road is also covered with snow and like any other year only local cars and sumo taxies are running on it from the Kinnaur side on daily basis. Even though the road is open, it doesn’t mean anyone can drive on it. The taxi drivers of Spiti are quite experienced with the road conditions and are fully prepared to face the toughest possibilities. For the adventurous among you, who still wants to drive on these snow covered roads, you have to be prepared. Driving on these roads in winters can be really dangerous. Himanshu Khagta has written an informative post on the topic. He is living in Spiti this winter for his project, ‘Life in Spiti’.